The Indian golfer came through a see-saw battle as he shot four-under 67 to finish at 14-under. Pattaya: Indian golfer Shiv Kapur on Sunday produced a dramatic turnaround in the closing stages to win the Royal Cup and end the year on a high note by claiming his third Asian Tour title of 2017 in Pattaya. The 35-year-old, who had just one win in almost 11 years till April this year, has now won three times in last eight months. Making the win sweeter for Kapur was that his wife Maya and five-month old daughter, Veda, were present on the 18th green. Kapur came through a see-saw battle as he shot four-under 67 to finish at 14-under, while Thailand's Prom Meesawat (70) ended at 13-under. Making it a great week for Indian golf was Gaganjeet Bhullar (66) who was sole third at 11-under 273, while Khalin Joshi (67) was sole sixth at 8-under 276. 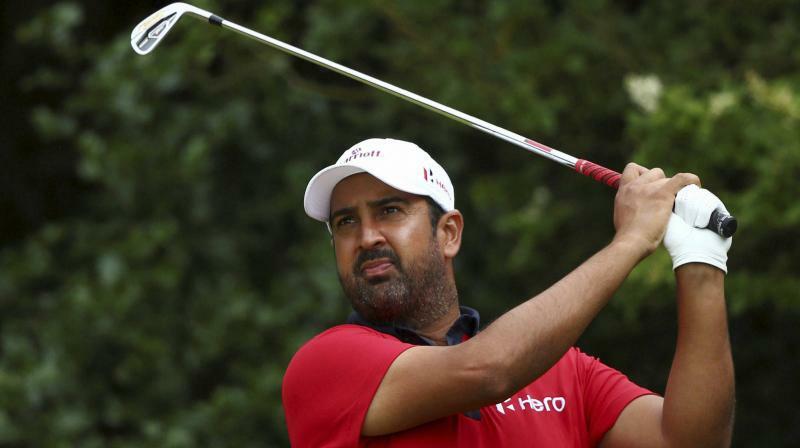 Jyoti Randhawa (72) finished tied 41st at one-over 285. Kapur first won on Asian Tour in his debut season in December 2005, but it took more than 11 years and four months for the next Asian Tour win, which came in April 2017. Now he has won three times in eight months. This latest win marks Kapur's fourth Asian Tour win and sixth international title - he won twice on European Challenge Tour, too. Kapur, the only multiple winner on Asian Tour this year, is also the only Indian to have won three times on Asian Tour. Kapur, who had 19 birdies against five bogeys this week, earlier won the Yeangder Heritage and the Panasonic Open India this season. "I felt that I made a bad swing on 13th and that carried over to the next hole. After the two bogeys, I was obviously disappointed as a two-shot lead turned into a two-shot deficit," he added. With four holes remaining, Kapur mounted yet another challenge. "Standing on the 15th tee, I told my caddie that we're not going to go down without a fight. Let's make a birdie here and see what happens or at least give myself a chance going into the last two holes," Kapur said. "The birdie there (on the 15th) got me back into the tournament." After holding a share of the lead for first two rounds, Kapur fell back by two to Meesawat after the third round. Kapur had yesterday said he needed a fast start to challenge the Thai and he did just that with a three-under front nine, while Meesawat traded three birdies with three bogeys to play the front nine in even par. 12th, while Kapur bogeyed 13th and 14th. From two ahead Kapur was two behind -- 12-under to Meesawat's 14-under. It was once again Kapur's turn to rise to the challenge. He produced dramatic birdies on 15th and 16th to catch up with the Thai. Playing together they came to the 17th tee tied at 14- under, when Meesawat 3-putted and bogeyed 17th to hand Kapur the lead. Kapur parred the 17th and 18th, while Meesawat needing a birdie to force a play-off missed one narrowly and managed only a par on the 18th.